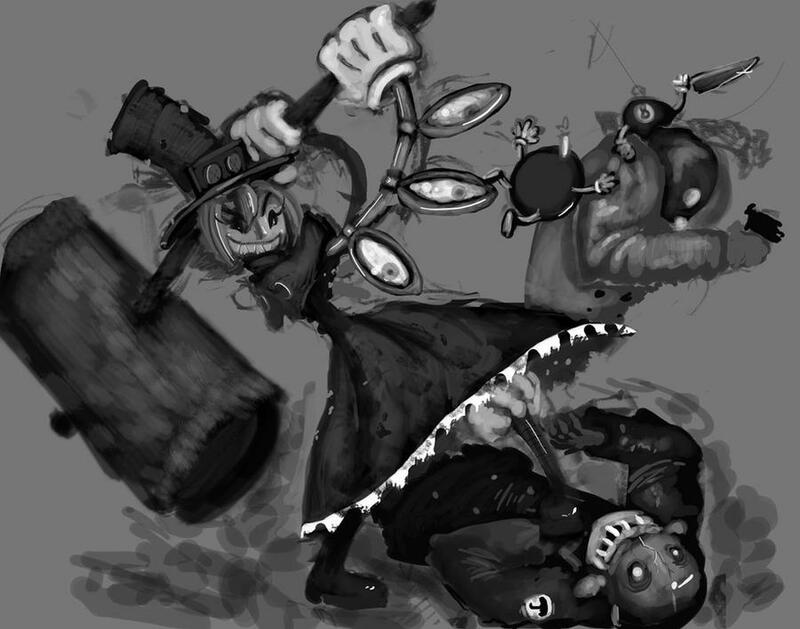 It’s Friday, so once again we’re sharing some of the art created by Skullgirls’ most-devoted fans. Pickings are getting a little slim (hint, hint! ), so we’re opening the field to some additional characters moving forward: confirmed characters will always get priority, and ensemble pictures over that. Let’s see more of the girls fighting or interacting with one another, people! And remember, you can always submit your own fan art directly at fanart@revergelabs.com. This awesome piece by Pixiv’s Zeeru is simultaneously dynamic and adorable! Vice-Versa struts his stuff in this great drawing by Teben-the-Every. In this speed painting by Talentlessfiend, nobody gets in Peacock’s way, even the Canopolis military! This sultry painting of Parasoul by Pinku really stood out. Love the ones by Zeeru, Talentlessfiend and Pinku, good work! Oh, oh no. I can’t believe you guys posted that ancient picture from 2003. D8 How embarrassing!